There’s something about a stick-to-your-ribs breakfast that just makes the morning better. Granted, you can’t do it every morning, but a weekend indulgence is just the time to reacquaint myself with my rural roots. When I was a kid, the best thing in the world was to spend the night at my grandparents’ house. It was totally full of unique experiences: hunting forgotten treasure in the woods; a ride in the wagon pulled behind the tractor; sleeping on the hide-a-bed (OK, I was 6. It seemed like an adventure then – now it would break my back); but the best experience was breakfast. You have to understand, when I was a kid, breakfast at our house was cereal and milk – every day. I mean, every day. Both of my parents worked, and my mother has always looked on cooking as a chore to be avoided whenever possible. So a weekend at my grandparents’ meant a true, rural farmhouse breakfast: biscuits, gravy, fried eggs, the works. It always made the rest of the day a little brighter to begin with such hearty fare (or maybe it was just some sort of arterial haze because of all the grease, salt, and carbs). Obviously, my grandmoteher was a bigger influence on me when it came to the kitchen than my mother was. My grandmother would never have made this dish (I grew up far enough north that grits were still foreign), but it certainly reminds me quite a bit of her breakfasts. The nice thing about this dish is that it puts all the components of a hearty breakfast (eggs, ham, cheese, grains, and milk) in one pot. And it only takes a few minutes to pull it all together. If you want, you can certainly cut back on the butter and cream, but why? A hearty breakfast was meant to fill your stomach, not watch your waistline. I’ll admit that this is not the most sophisticated of dishes in my repertoire, but it puts a smile on my face. I also know that a lot of people have a natural aversion to grits. If I called it polenta soufflé, I’m sure it would get much more consideration. Don’t believe me? Ask 10 people if they like polenta. Then ask the same people if they like grits. You’ll get a majority to answer yes to the former and no to the latter. Honestly, the only real difference between grits and polenta are A) the size of the grind; and B) the color of corn used. 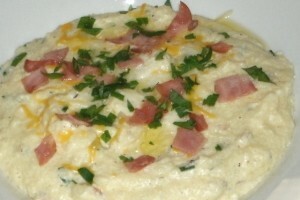 Grits are usually made of white corn and ground more coarsely. Polenta is usually yellow corn and a finer grind. There is this whole thing about grits and hominy, but it just confuses the issue. I challenge you to make the same dish with grits and polenta and have someone be able to tell the difference. Melt 4 T of butter in a large sauce pan over medium heat. Add deli ham and sauté until browned (about 5 minutes). Drain ham and set aside. To the saucepan, add milk, dried thyme, red pepper flakes, 2 T fresh parsley, salt and pepper to taste. Add ricotta cheese, parmesan cheese, and ¾ C of Colby jack cheese. Return to simmer and stir until fully incorporated. Slowly pour in quick-cooking grits, stirring continually. Cook for 6 to 8 minutes, constantly stirring. Add most of the ham back into the pan (reserving 1-2 T for garnish) and stir to combine. Check seasonings and adjust if necessary. Remove pan from heat and slowly pour in eggs, stirring vigorously to combine eggs before they cook. Let stand for 60 to 90 seconds before plating. To serve, garnish with remaining butter, cheese, ham, and parsley. If you want to make this really decadent, then switch out the milk for half & half, or substitute half of the milk with cream. So if it makes you feel better, by all means call this dish polenta soufflé. But having this breakfast is all that I need to feel better – no matter what you call it. This entry was posted in Cooking and tagged breakfast, grains. Bookmark the permalink.